This year marks the 150th anniversary of the birth of Edward Douglas Fawcett, on 11 April 1866 in Hove. He was the author of three rare, bold, strongly imagined fantasies or scientific romances. 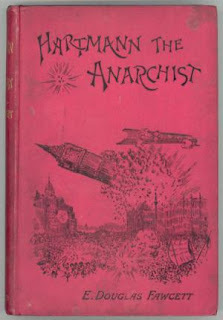 The first of these, Hartmann the Anarchist (1893), has the title character bombarding London from his deadly airship in protest at capitalist culture; the second, Swallowed By An Earthquake (1894), has hollow earth and lost race themes; and the third, The Secret of the Desert (1894) has an expedition using a vehicle very like a tank (not invented for another twenty years or so), finding a lost civilisation of the Phoenicians. These books have rightly been compared to the work of Wells and Verne, although another counterpart might also be George Griffith, author of The Angel of the Revolution (1893), also about anarchism imposed by an airship. But these are far from the only fascinating aspects of Fawcett’s life. For one thing, his brother was Colonel Percy Harrison Fawcett DSO FRGS, who went missing in 1925 deep in unexplored Brazil, in search of the lost city he called “Z”, accompanied by his eldest son Jack, and Jack’s friend from school-days, Raleigh Rimell. “Was it possible,” he had asked, “that in the unknown heart of South America there still lived descendants of the old races? Why not?” The mystery of their disappearance has never been satisfactorily solved, despite a number of claimed explanations, apparent clues and false trails. Some of Colonel Fawcett’s writing reads as if it were straight out of a lost world or lost race romance: “Whether we get through, and emerge again, or leave our bones to rot in there, one thing’s certain. The answer to the enigma of Ancient South America – and perhaps of the prehistoric world – may be found when those old cities are located and opened up to scientific research. That the cities exist, I know….”. Both brothers seem to have shared a deep interest in the frontiers of human thought and the imagination. Douglas Fawcett was a noted mountaineer and chess player (pursuits he shares, incidentally, with Aleister Crowley), and later gave much of his energy to mystical philosophy. His book The Zermatt Dialogues (1931) has a semi-fictional framing in the meeting of a group of mountaineers in the Swiss Alps, where in a chalet amid the icy purity of the snow they discuss the secrets of the universe. They comprise West, a mystic; Anderton, an Oxford don; Stark, a professor of physics; Leslie, a pagan poet; and Delane, an explorer and fascist MP. There are over 500 pages of rarefied conversation, sometimes bafflingly abstruse, but also with genuine interplay between the characters, with crisp wit, respect for differences, and trenchant, even pungent argufying. The theory Fawcett explores he calls Imaginism, essentially the idea of the ultimately real as a work of art in constant creation. For some reason, The Zermatt Dialogues is quite a rare book to find. I appreciate that it perhaps did not have a major print run when it was published, but it was from a mainstream publisher (Macmillan), and was reviewed politely, if not always comprehendingly, in the significant journals of the day. I have sometimes entertained the idle fancy that there is a modern coterie of Zermattians secretly securing copies of the book to prevent its mystical insights falling into the hands of the profane. The likeliest chance of getting hold of it for a reasonable sum, in second-hand bookshops, is when it is shelved rather casually under Mountaineering or Exploration rather than philosophy. An excellent discussion of Douglas Fawcett, in all his many facets, but with a particular emphasis on his chess, may be found at the Keverel Chess website. There was a documentary on BBC 2 last year called 'The Bones of Colonel Fawcett'. An interesting character study of the colonel, his son Jack and the friend. There is a book by Col. Fawcett - "Exploration Fawcett" and South American mysteries on Ebay right now. Coincidence? I think not. My grandad used to have a bookcase full of volumes with illustrated boards, one being on the lost Fawcett expedition. I was fascinated as a child by a plate showing a monstrous Anaconda about to devour someone. I believe it's pretty much now accepted the intrepid searchers were eaten by natives with a taste for 'long pig'.